Well, I am missing California and this song just brings back the whole feel of California. I LOVE California! With all the moves we have made, the only one where I really cried about leaving was when we left Southern California. I think California is a difficult place to get out of your blood. It was the one place where my soul felt home. 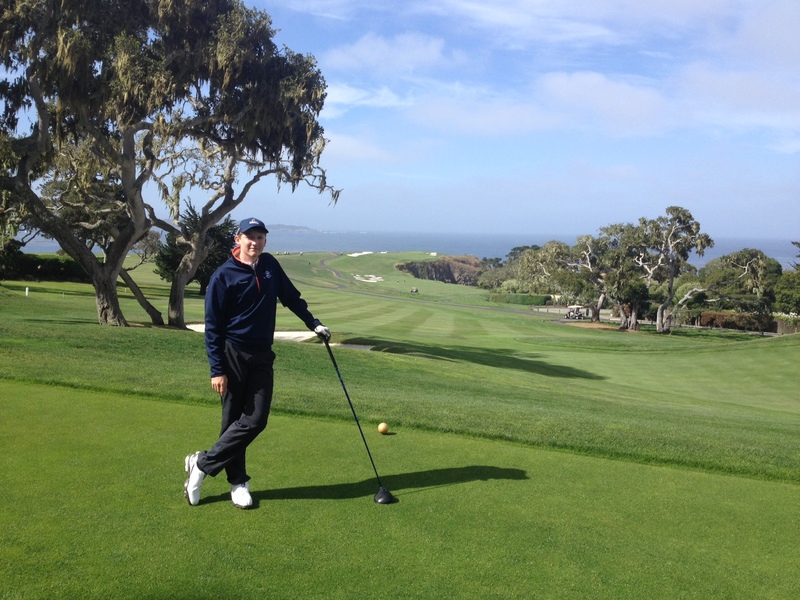 We were lucky enough to get to spend time at Pebble Beach, California last week. 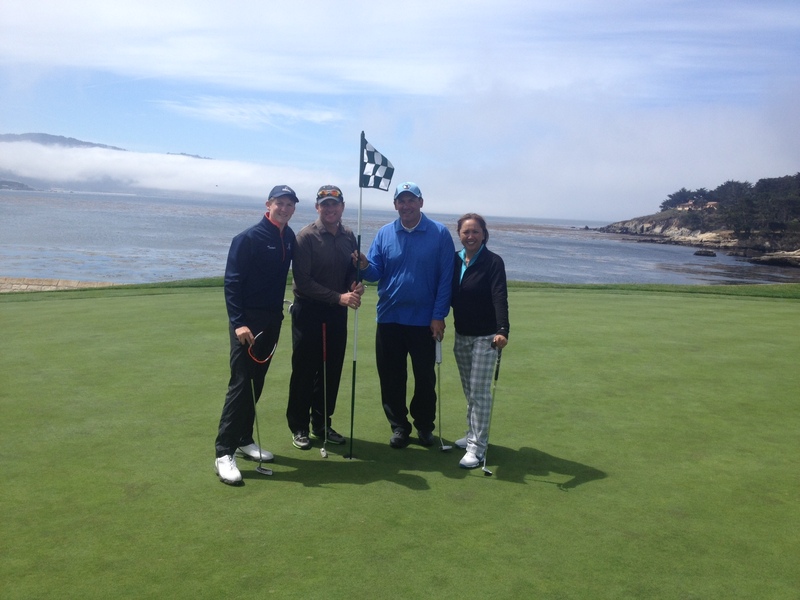 My two boys were especially lucky to get to golf at Pebble Beach. For a golfer, I cannot think of anything more special. 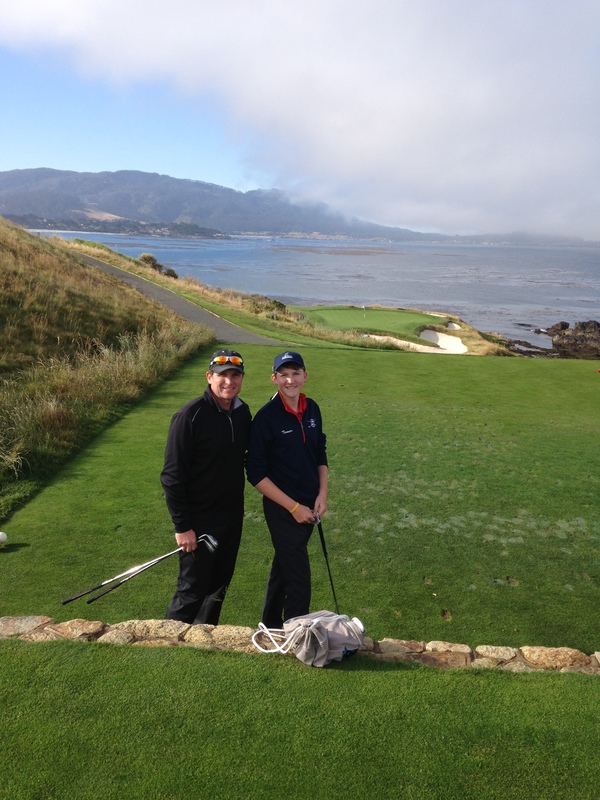 Father & Son thrilled to be at Pebble Beach! 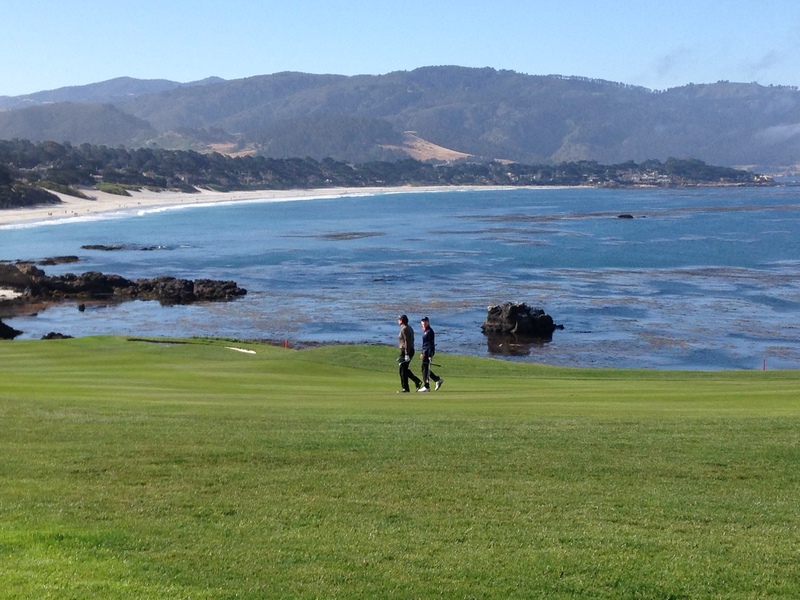 While the boys golfed, I followed along to watch them play and enjoy the beautiful course. I have never seen anything quite so stunning! 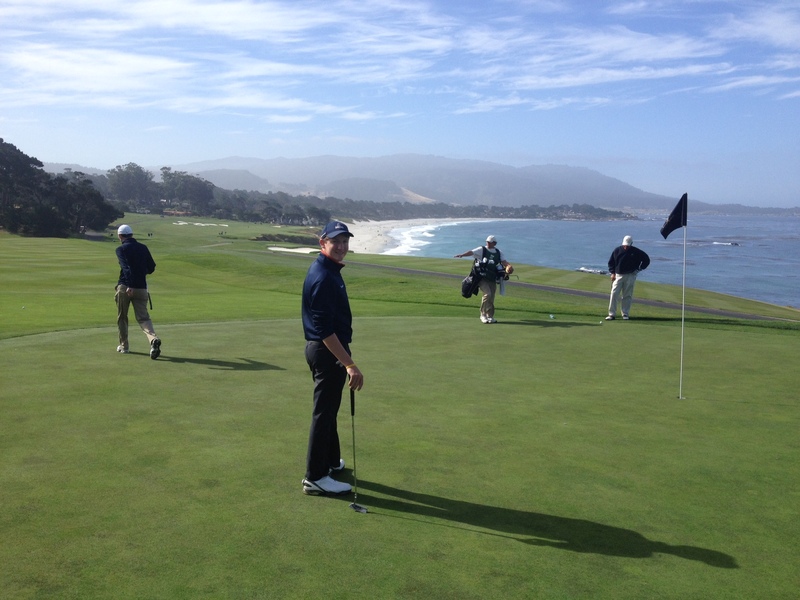 I have spent time in Carmel, California (which is the beach and town the course overlooks in some of these pictures) and I have even been running on 17-Mile Drive, but I have never before been on the 18 holes of Pebble Beach Golf Course … and that is just something truly unreal! 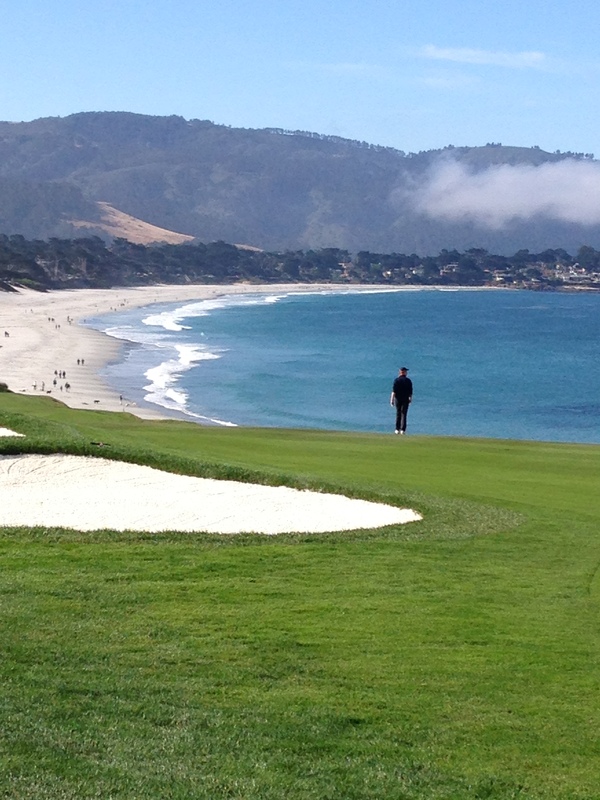 Amazingly beautiful and, as they say, “the greatest meeting of land and water in the world.” How do you focus on golf when looking at those views?! Just as proof that everyone wants to golf this course, while we were there we saw Michael Bolton and on Day One, the boys were paired with Carolina Panthers Head Coach (and NFL Coach of the Year in 2013), Ron Rivera and his wife. They were two of the nicest people we have ever met and, although it was not their first time playing the course, they were just as excited to be out playing the remarkable course as we were. Today’s song is by a group of young Californians from Carlsbad, called Dirty Gold. The band is comprised of brothers Lincoln (vocals/lead guitar) and John Ballif (keyboard/rhythm guitar), and friend Grant Nassif (drums). This song was released in 2011 (along with their album, Roar) while the boys were still in high school and it hit the blog world by storm. I hope you enjoy it and that it leaves you yearning for California like I am.